I've decided to start a MySpace page for Drexciya Research Lab. Why you ask, why for you dear reader! It may serve you as a way to connect with people with similar interests from the same city (Stay Safe) or at least in an online capacity. The MySpace thing is a good principle and another way to help all things Drexciya/Heinrich Mueller related to reach some sort of critical mass/tipping point leading to who knows where, reissues, a wider recognition/influence, their place in the Hall of Fame! I guess I'm also curious, as you may be, as to who is reading at this stage and what their and other fans feelings are regarding all things Drexciya related at this point in 2006 and beyond. The Blog is getting about 1000 hits a month at this stage which to me seems like a lot so maybe there's enough regular readers to justify this expansion into a third format, although this is more another aspect of DRL rather than another version of the same material as the website is. Post what you want but best to still use the comments box on the Blog when raising an issue on a particular article. But in saying that it's still totally up to you what you use it for, it will all get read by me in the end, but at this stage I see it primarily as a way for you to connect with each other. So please drop by, join, discuss, lurk, whatever and we'll see how it evolves. This additional text can be found on the MySpace page which is probably worth including here for our own new comers. If this is your first time to come across Drexciya Research Lab and your wondering what it is I will explain. 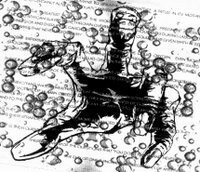 Since May 2005 I have written extensive articles on each of Drexciya’s albums and 12”’s including discovering what I believe is the correct order for the Storm Series. I have also collected six interviews by James Stinson, putting his words into categories like origins, water, storm series etc to see his overview on these subjects. I am currently working my way through all the Gerald Donald/Heinrich Mueller releases, who was of course the other half of Drexciya. Various other strands of thought on this subject come and go. What’s next? More words on a subject that still remains essentially an enigma.